In this NYTimes article Kerry says that September 11th didn't really change him. Go figure. I think we kind of knew that. Then he fumbles around and tries somehow to say that he was always ready to go after Al Qaeda as if 9/11 had happened. 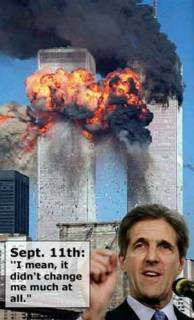 When I asked Kerry how Sept. 11 had changed him, either personally or politically, he seemed to freeze for a moment.